RV routes throughout the USA. 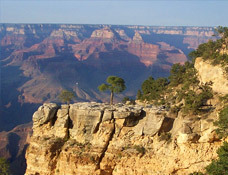 With a motorhome rental, you can enjoy spectacular sights, independence, and closeness to nature. Motorhomes are also known as Campers or Recreational Vehicles (RV). 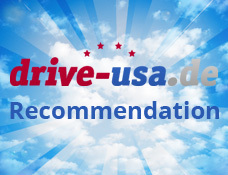 Relaxation, combined with unforgettable impressions and memories, this is what a motorhome rental in the USA has to offer. This adventurous route offers breathtaking scenery paired with diverse landscapes. This is perhaps the most popular RV route in the U.S. Starting point is San Francisco, the City by the Bay. From there, you drive down the famous Highway No. 1 to Los Angeles. Then, your journey will take you across State borders to Las Vegas. Continue your route to visit some of the most beautiful national parks: Grand Canyon, Bryce Canyon, Zion, Death Valley (not allowed during the summer months), and Yosemite. Once you have spent the desired time visiting these sights, you will make your way back to San Francisco. Discover the city, in which the Hippie era had its beginnings, and artists and musicians like Janis Joplin, The Grateful Dead, and Jefferson Airplane heavily influenced the style of the Haight-Ashbury district. The Golden Gate Bridge is of course a must-see. You can explore this area on a beautiful bicycle tour. A visit to Alcatraz and a ride in the famous Cable Car should also be on the itinerary of anyone visiting this incredible city. 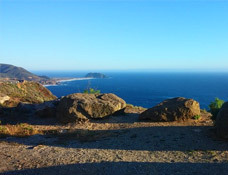 This famous highway will take you along the coastline with amazing views of the Pacific. Watch sea lions relaxing on the beach; discover Monterey and Carmel, the city where Clint Eastwood once was mayor. This road will take you through the coastal terrain of Big Sur, passing Julia Pfeiffer State Park, where you should certainly plan a stop to see the incredible waterfall. Have coffee at the pink hotel, Madonna Inn which is located in the charming city of San Luis Obispo. Here you will also find the bizarre but famous Bubblegum Alley. A beach vacation with some South American flair can be found in scenic Santa Barbara. LA is most famous for its movie industry. Spend a day at Universal Studios Hollywood, or take a guided bicycle tour through Malibu, Santa Monica, and Beverly Hills to see where the local stars and celebrities live. Enjoy the areas beautiful beaches. Go for a stroll along the famous Venice beach promenade. Check out the guided hiking tour through the surrounding hills, which are the location and backdrop for many movies. 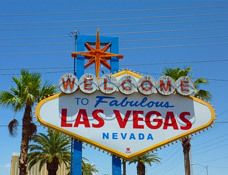 Even if you are not interested in Poker, Roulette, or slot machines, Las Vegas is certainly worth a visit. The world’s tallest Ferris wheel, thrilling roller coasters, incredible shows and nightlife, are just a few reasons you should not skip this city. See Freemont Street by night or stop by the Neon Museum, where old advertisement signs from classic Vegas hotels, casinos, and attractions take you back in time. 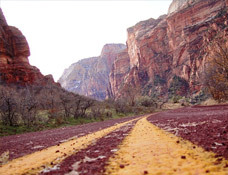 Optional: You can stop in Las Vegas on your way from Zion National Park to Death Valley.  If you do not want to pass Las Vegas twice, you can certainly drive to the Grand Canyon via Lake Havasu. 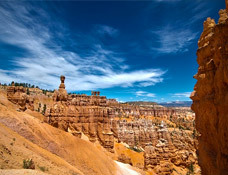 Bryce Canyon is known for its colorful, spire shaped rock formations. 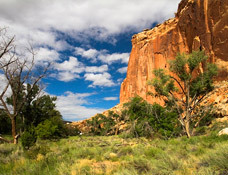 Hike along the Navajo or Queens Garden Trail to experience the beauty of this wondrous terrain. The Red Rocks, combined with the iridescent waters of the Emerald Pools, and the luscious green of the trees and bushes, make for a beautiful natural color display. Optional: If you still have some time, you should drive through Page at Lake Powell and stay for about 2 nights. From here you can schedule a tour to visit Antelope Canyon. Plan a stop to take in the incredible view of Horseshoe Bend. During the summer months, temperatures can reach up 50C. Due to the scorching heat, driving a motorhome through Death Valley in the summer is not allowed. 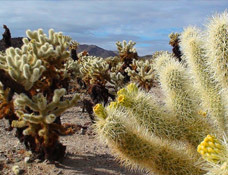 Very little life can exist in this extreme dessert environment that is surrounded by mountains. 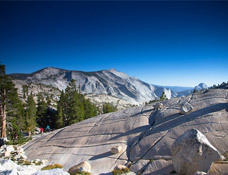 Optional: If you would like to take in more of the western landscape, simply plan an additional 2 day stay at Sequoia national park in the Sierra Nevada Mountains of California. Here you will find the world’s greatest concentration of giant sequoia groves. After driving through Death Valley, you can easily imagine how happy the settlers must have felt when they finally passed the harsh mountain terrain, and looked upon the beautiful scenery of the Yosemite with its waterfalls, luscious alpine meadows, creeks and towering trees. 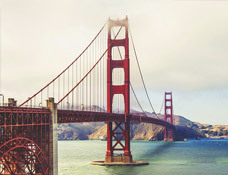 After your arrival, spend about 3-4 nights in San Francisco before picking up your motorhome. Staying in a centrally located hotel will give you the opportunity to have a couple of days to explore the city by foot or by Cable Car. This route is truly something special for any nature lover, offering vibrant colors, vast landscapes, fascinating rock formations, and incredible views from its mountain passes. 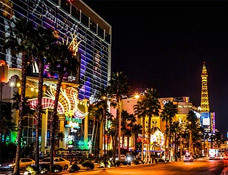 View the flashing lights and Neon signs of the famous Las Vegas Strip from afar. From your starting point, Las Vegas, you will travel towards the Grand Canyon. 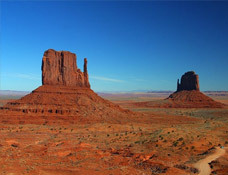 On this route you will be able to visit Monument Valley, then further North Canyonlands and Arches national park. Towards the South you will pass Capitol Reef national park, and travel along Highway 12 through Boulder Mountains. Although the up to 3.000 meter elevation might make for a very curvy drive, the incredible views are worth it. From here you will travel to Bryce Canyon and Zion national park before returning back to Las Vegas. A visit to this famous gambling town is a must. Even if you are not interested in Roulette, Poker, or slot machines, there is still plenty to see and do. Ride the world’s largest Ferris wheel and take in the unbelievable sights of the city and its surroundings. Experience thrilling roller coasters, world class shows, and of course the fabulous nightlife. Visit Fremont Street with the Neon Museum at night to experience the old Vegas. Welcome to this world renowned canyon. Enjoy the magnificent views into the canyon from the new observation point. Traveling along the South Rim will provide even more opportunities to stop and enjoy more views from the many look-out points. If you are driving from Las Vegas, you will be able to travel some of the distance on the famous Route 66. Monument Valley, a region of the Colorado Plateau, is known for its unique sandstone formations. You might recognize this landscape, because it is a popular filming location for many Western movies. Wind, rain, and fluctuating temperatures over the past 50 million years shaped these vast sandstone buttes. Besides hiking, horseback riding, and a Jeep tour, stargazing is also a popular activity at Monument Valley. 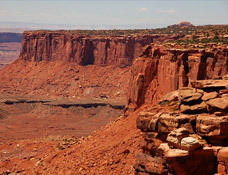 Canyonlands National Park is located within close proximity to Arches National Park. The park is divided into 4 sections; Island in the Sky, the Needles, the Maze, and the Green and Colorado Rivers. The Island in the Sky area is an elevation, surrounded by the Colorado- and Green River. From here you can enjoy incredible views of the White Rim. In the Needles section, colorful spires of sandstone dominate the landscape. Arches National Park is located in the northern part of the Colorado Plateau. 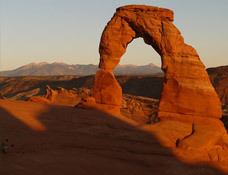 This park has the world’s largest concentration of natural sandstone arches that form through erosion and weathering. Over 2000 arches are located within the park, providing perfect picture taking opportunities. Explore this area on a beautiful hike. There are many trails to choose from, suitable for all skill levels. At first glance, these rugged rock formations located close to the Fremont River, look like Reefs. A little further to the south, the Boulder Mountains impress us with a beautiful green luscious mountain range that reminds a little of the mountain regions you find in Europe. After you have visited many National Parks and seen the impressive rock formations, you are now traveling to one of the most spectacular terrains. 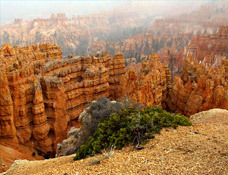 Bryce Canyon with its Hoodoos (geological structures) were formed by weathering and erosion. 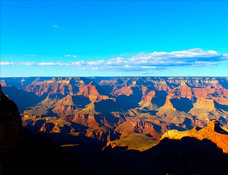 The different colors in the rocks provide stunning views for the Canyon visitors. Especially incredible is the view in the evening when the light of the setting sun reflects of the red rocks and highlights the incredible colors. Red cliffs combined with the iridescent waters of the Emerald Pools, and the luscious green of the trees and bushes, make for a beautiful natural color display. Optional: Drive through Page at Lake Powell and stay for about 2 nights. From here you can visit Antelope Canyon and Horseshoe Bend. 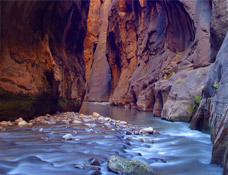 On this route you will experience 2 of the most popular historic natural monuments in the USA. From Denver you can already see the impressive foothills and beginnings of the Rocky Mountains. 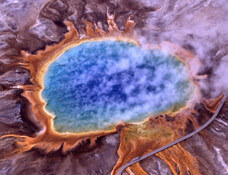 The beautiful geyser landscape and the incredible colors of Yellowstone will leave you with a lasting impression. Your journey begins in Denver, Colorado. From here you will travel through Boulder to reach the Rocky Mountains National Park, then you drive to Cheyenne, Wyoming. Further to the North you will reach Guernsey State Park with Mount Rushmore. 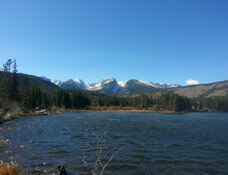 From here you will drive to Bighorn National Forest and Yellowstone National Park. 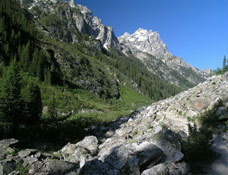 From Grand Teton National Park you will drive to Salt Lake City, finishing your trip in Denver. Optional Add a few extra days to your trip and visit the Black Canyon, see the great dunes of Sand Dunes National Park, and visit the archeological sites of Mesa Verde National Park. This city has lot to offer for art and music lovers. Enjoy a visit to the Botanical Garden, the zoo, the Red Rock Parks, the Aquarium, and the house of Molly Brown (known for being a survivor of the Titanic disaster and a women’s rights activist). If you are a sports enthusiast you can’t miss a stop at Coors Stadium. The 16th street Mall is a perfect spot for a shopping excursion. Here you’ll find shops, cafes, bars and restaurants (take advantage of the areas free bus fare). 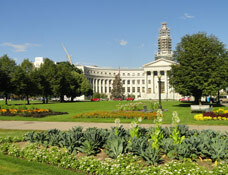 This beautiful town is located on the foothills of the Rocky Mountains and a perfect first stop after leaving Denver. 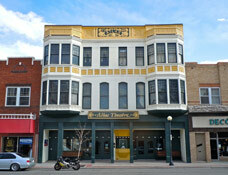 Boulder is a University town, located about 45 kilometers northwest of Denver. The almost 300 days of sunshine are due in part to its elevation of over 1600 meters, combined with the dry alpine climate. Besides beautiful views, Boulder also offers a downtown shopping district filled with iconic shops, boutiques, and restaurants. The Capitol of Wyoming is also known as the Magic City of the Plains. Cheyenne became a prime settlement location in 1867 due to the route planning for the rail system. The city became the main location for farmers to raise cattle. Cheyenne is the most populated city of the State. If you visit in July, you should certainly attend the world’s largest rodeo and Western celebration during the Cheyenne Frontier Days. The Wyoming Transportation Museum and the Old West Museum are also a popular place to see. 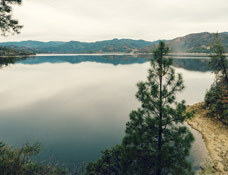 Guernsey State Park is well liked for its Guernsey Reservoir and its nature hiking trails. Take a refreshing dip in the cool waters or just rent a boat to explore the area. You will find plenty opportunities for a picnic, or have the little ones enjoy some of the areas playgrounds. The location is also perfect for fishing or bird- and wildlife watching. You should plan a night stay here or on the way to Badlands National Park. The total miles for this stage are around 239 miles. We recommend not to travel more than 150 miles per day, but this is certainly up to you. If you don’t mind the long drive, you can always cover the entire distance in 1 day. The Badlands received its name because extreme temperatures, lack of water, and the exposed rugged terrain make it unusable for any kind of agriculture. The National Park includes the incredible rock formations, as well as the areas undisturbed mixed grass prairie. 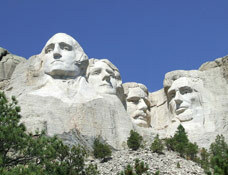 Mount Rushmore is located about 3 to 4 hours from Guernsey State Park. On your way, you will pass Thunder Basin and the Black Hills. This area might look familiar, since it was used as the location to film many of “The Battle of Little Bighorn” movies. Mount Rushmore is quite possible the most famous American mountain. The massive sculpture carvings of the heads of George Washington, Thomas Jefferson, Abraham Lincoln, and Theodore Roosevelt are a landmark that is recognized all over the world. Located about 3 hours from Mount Rushmore are the Bighorn Mountains. Here you will find diverse landscape of towering mountains, spectacular canyons, and vast mountain meadows. Cloud Peak is the highest elevation at 4000 meters. This is the last existing active glacier in the Bighorn Mountains. 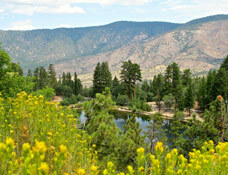 Imagine green, luscious meadows, clear sparkly lakes, surrounded by snow covered mountain peaks. Not many landscapes in the world compare to the breathtaking beauty of Grand Teton National Park. This makes for a perfect spot to fish, swim, boat, or take a guided hiking tour. Not only is this the capitol of Utah, but also the largest city in this State. 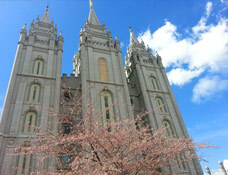 Located to the east of a large salt lake, this city was founded by Mormons in 1847. The Mormons had to flee the eastern states because they faced discrimination due to their religious believes. They became the first white settlers in Utah. Besides the Mormon Temple, which was built in the 1900s, you will also find the Red Butte Garden and Utah Hogle Zoo. Children will enjoy a visit to Discovery Gateway, a museum with interactive displays. Optional: If possible, we recommend a 1 week extension of this journey. This will give you time to reach Denver by a more southern route. Visit Dinosaur National Monument, the Black Canyon national park, ride the Silverton Train in Durango, and enjoy a visit to Mesa Verde national park. A very impressive and unexpected sight are certainly the dunes of Great Sand Dunes national park. Visit the Garden of the Gods in Colorado Springs, before heading back towards Denver. * All the information are recommendations only. Please add approximately 20% to the entire rental duration/distance, considering visits to the supermarket, excursions, shopping, etc. This will give you an idea about how many miles you should purchase. It may not be completely accurate and you might use less or more miles than pre-purchased. Please note, amounts paid for unused miles can not be reimbursed. Our Tip: Always enter the desired minimum mileage. The display will then only show you the offers that have the desired mileage included. 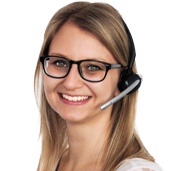 Booking a motorhome without any mileage is not recommended. In this case, the rental company will charge you for the miles driven when you return the vehicle. This can lead to very high additional costs.